On the front facade the second floor central Palladian window at the center of the house is flanked by two, four window bay windows, which are repeated on the first floor. The bay window bays are capped by 12:9 steep gabled roofs with pressed tin single finish, which is original to the house. The original oak arched vision panel front door with the original etched cut glass arched transom. This cut glass pattern can also bee seen in two of the original brass gasolier interior light fixtures, which appear to have been converted to electricity at the turn of the century. The original front hall stairwell and newel post are still intact as are hardwood veneer floors. appears to have been created before other development occurred in the area, which was just north of Sherman. Following his daughter’s marriage, R.M. 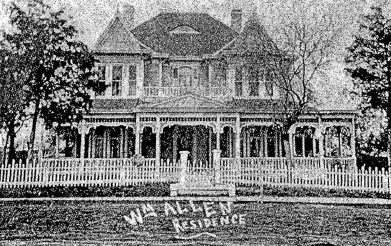 Board sold the house at 504 Tucker Street in 1895 to William Allen of McKinney. In 1896 Mr. W.M. Allen completed the purchase of the house and moved in,making no major changes in the house. The Allen family meat packing business grew and was known in McKinney through the 1980’s. The porcelain tile inlay in the front sidewalk, WA for William Allen in overlapping letters, remains today. L.R. 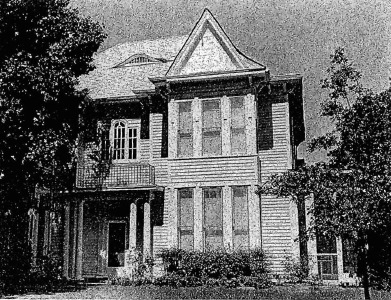 Kirkpatrick, son of Elbert Kirkpatrick famous horticulturist and founder of Southwest Nursery in McKinney, purchased the house in 1929. Southwest Nursery, one of the largest nurseries in the United States, and originator of the Benge Walnut, and McDonald Blackberry and other unique hybrids. Mr. George Jones purchased the house in 1940 and operated his business from the house in later years. Jones appears to have enclosed the porch below the upper sleeping porch as a new dining room turning the original dining room into a downstairs bedroom. The original fireplace, which was on the west side of the house, was removed for a new bathroom (foundation uncovered at the time of the restoration done by Florene and James West). At the same time the fireplaces were removed and a new den room was formed to the side of the dining room and a new laundry room and bathroom was created in an extension on the first floor to the north. (13) The east west street immediately north of Tucker Street is named for Mr. Jones. After World War II Mr. Jones developed small ‘G.I.’ houses along Jones Street for sale to returning veterans. Florene and James West purchased the house in 1993 from the family of George Jones. Restoration included new plumbing (all lead drains were removed and upgraded), new wiring, new H.V.A.C. systems, new insulation, and refinishing inside and out maintaining all original casings, window, doors, and trim. A second floor bedroom was added above the former laundry and restroom added by the Jones were were removed and upgraded to a large breakfast room with doors to a new rear elevated deck. The original kitchen space was retained with the original beaded board ceiling above which the original standing seam metal veranda roof remains. The Wests installed working fireplace with a chimney and an antique oak mantle with over-mantle mirror from a Victorian house in Virginia, which replaced a space heater with its painted mantle installed by the Jones. 1.-3. The Architectural Heritage of McKinney, Published by Williamson Printing, edited by the Owl Club of McKinney, 1972, Page 56.